Along with her sister ship the Marina, Oceania Riviera has been dubbed the most sophisticated and elegant ship to debut in the past fifty years! 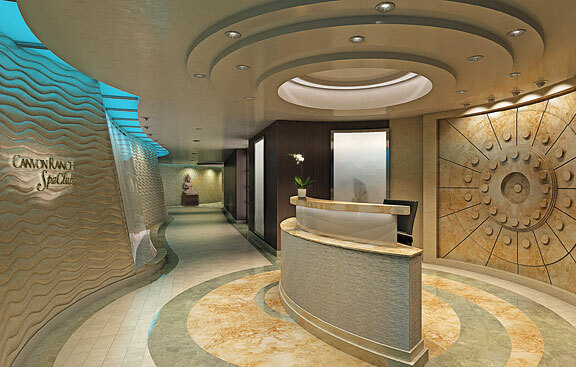 This ship glimmers with its designer touches that adorn every open space; the Owner's Suites are furnished in Ralph Lauren Home, and every stateroom and suite showcases the Oceania Cruise experience. The ship is able to retain the charm of the other ships in the Oceania fleet, while bearing more guests for a voyage laiden in style and elegance. Enjoy a casual, country club ambience and a standard of personal service rivaled by none, while exploring a myriad of enticing amenities. 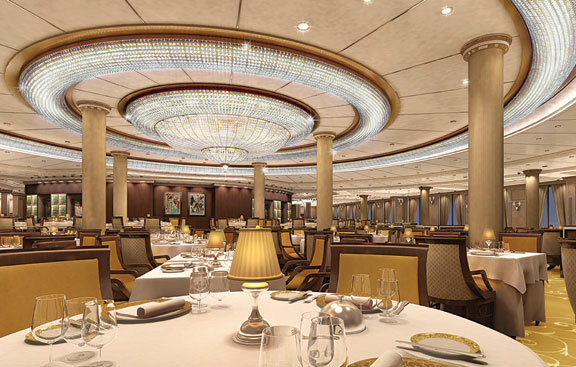 Designed to impress the lover of fine dining and travel experience, this fine ship boasts a total of ten dining venues; six of these are open-seating gourmet restaurants, where meals are already included in your trip. Even with so many additions and amenities, Oceania Riviera is able to maintain a familiar atmosphere - with everything that guests adore, and even more on offer, this is the ideal ship to take your next vacation on. Oceania Riviera sports many exciting activities for you to enjoy, and there is something for everyone! If you wish to relax, head to the Canyon Rand SpaClub® where you can experience true bliss. Offering acupuncture, ayurveda, body treatments and wrabs, conditioning body scrubs, massages, skin care, tanning treatments, special couples massages and more, this is the ideal spot to "get away from it all!" If you'd like to further pamper yourself, try the onboard salon where you can get color and highlighting treatments, hair design, makeup, manicures and pedicures all at your convenience. The Wellenss Center is the perfect place to stay fit on your voyage; offering a variety of personalized programs, you can pick and choose how you'd like to challenge your body! There is a basic fitness assessment, as well as Exercise for Weight Loss programs, Body composition Analysis, Yamuna Foot Fitness classes, Performance Orthodontics Assessments, and much more. Guests can even utilize personal training sessions! There are even specialized wellness services including "Exercise and Pregnancy," "Exercise and Blood Pressure," fitness classes, and back care. Marina also offers hands-on programs for those who are interested in learning to be artists; check out the Artist Loft, an enrichment center which offers step-by-step instruction delivered by talented artists-in-residence. Guests can learn needlepoint, as well as how to paint with watercolors, and other amazing artistic areas are taught as well. Develop your next artistic masterpiece, or read and relax at the Library; guests can indulge in the tranquility of an English-inspired library with more than 2,000 books with both non-fiction and fiction titles. The ship even has an internet center, where you can keep in touch with the rest of the world! The ship also has a large heated swimming pool and three whirlpool spas so you can take a dip or have a relaxing afternoon in a poolside lounge. On Oceania Riviera, each day brings a new culinary adventure - and with ten venues, there is something for every person's taste. The Grand Dining Room radiates with its luminous crystal chandelier and wide open space; stately decor imbues this gourmet restaurant in grandeur. 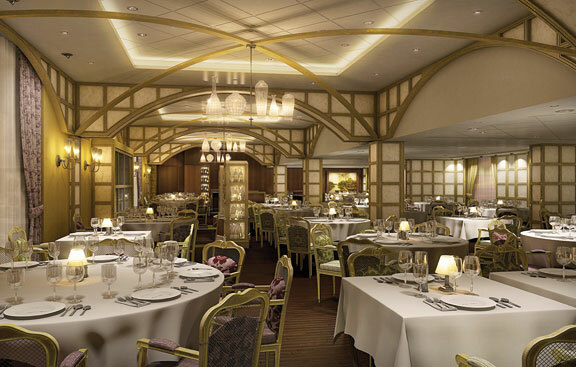 Decorated in rich woods, soft cocoa and cream and gold, this dining area has been patterned after the greatest 5-star restaurants of Europe, and boasts tables set with bone china, Riedel crystal, silver and cotten linens. Guests at the Grand Dining Room will enjoy course after course of European-inspired Continental cuisines, as well as healthy fare inspired by Canyon Ranch®. Each menu has a wonderful selection of dishes, and every day something new and different is added for your pleasure. Jacques is a classy restaurant that bears the name of the eminent chef Jacques Pépin. Pépin has taken the classics, deconstructed them and re-made each remarkable dish with his own creative flair, giving you a French explosion of flavor that will have your mouth watering. Red Ginger is an Asian-inspired restaurant that showcases three multi-colored Buddha heads along with some of the most delicious Asian menus you'll ever taste. For a traditional, intimate steakhouse ambience, try the Polo Grill - this fantastic bistro brings you your favorite surf and turf dishes, served at your leisure in a romantic, intimate setting. Toscana presents traditional Tuscan cuisine, with delicious food that will remind you of a home-cooked meal. Enjoy a meal at the Terrace Café where you'll indulge in sumptuous breakfasts, lunches with a choice of incredible international dishes, and dinner al fresco with a Mediterranean menu. With indoor and outdoor seating, this wonderful place has a certain charm! Waves Grill is a poolside spot that welcomes casual diners; this informal venue still pays the same attention to delicious detail that the finest of restaurants does, and you can watch as the chefs prepare and grill your food right before your eyes! Enjoy gourmet burgers, hand-cut fries, fresh salads and even gelatos and made-to-order sundaes, along with hand-dipped milkshakes so you can have a cold treat by the pool! Privée is the ultimate dining venue, which may only be reserved for parties of up to eight people, for a fee of $250 per evening. This exclusive venue boasts oversized white baby crocodile chairs, Baroque millwork, and a Ferrari Red carpet to set the mood. 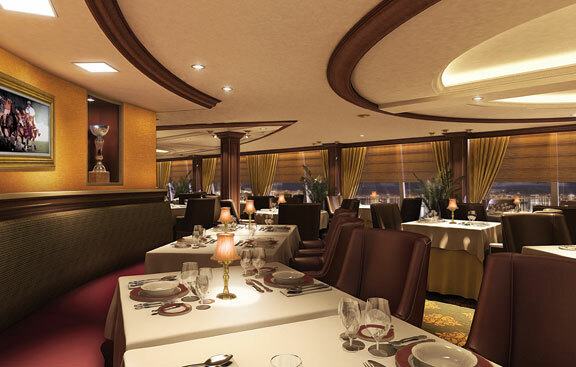 Guests are able to choose from the menu from Polo Grill, or from Toscana, or a combination of both - and each diner is able to create their own menu. La Reserve is another amazing venue, specially designed to titillate the wine lover's senses. This is an onboard wine-tasting center, with a series of seminars and tastings that pair the perfect wines with perfectly paired cuisines. Dinner at La Reserve is a comsummate experience, including a seven-course courmet dinner that pairs an appropriate premium wine with each and every course. 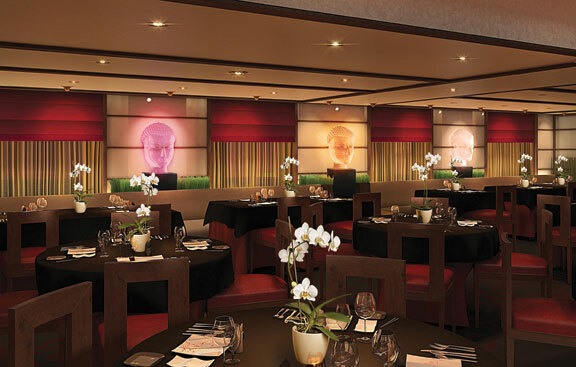 Another great dining experience can be found at the Bon Appétit Culinary Center - guests may enjoy the world's only hands-on culinary studio at sea, where expert Master Chefs provide instruction and help you expand your knowledge of local cuisines. There are 24 individual cooking stations so up to 24 guests can partake in each class, learning the secrets of homemade pasta and many more regional cuisines! Oceania Riviera is fully equipped to provide you with the best in entertainment both day and night. The Ship is home to a Monte Carlo style casino, full of slot machines as well as tables for blackjack, roulette and poker. There are nine bars and lounges with beverages ranging from coffee to cocktails and everything in between. For the an incredible variety of martinis, head to the bar that shares the name of this infamous drink, where you can enjoy good company and live piano music. There is the Grand Bar, the marina Lounge, La Reserve, the Casino Bar, Waves Bar, and more. 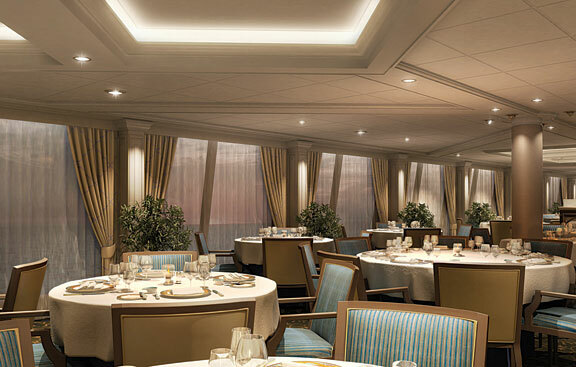 Horizons is an observation lounge with floor-to-ceiling windows that provide a captivating backdrop to the dance floor. There is an abundance of entertainers on board for every voyage. In the evenings, you can listen to the live music performed by an orchestra at sea; whether you wish to attend a live classical concert under the stars, or marvel at magicians, laugh at comedians, or simply relax at the bar and chat with new friends, this ship has it all. There is even a karaoke bar!